Mazda3 Hybrid: More Toyota than Mazda? Recently, a video showing off Mazda’s all wheel drive system popped up as a suggested video on my YouTube homepage. Interestingly enough, a Mazda2 was shown scampering up a snowy hill spinning all four wheels. This made me curious about what other odd options Mazdas get in Japan, one of which is a hybrid system. I made this discovery after I hopped onto the GooNet Exchange, which I am no stranger to. When I was trying to find the all wheel drive Demio, a renamed Mazda2, I noticed the Axela Hybrid tab. It’s important to note that the Axela is just the Mazda3 with a different name for Japan. Anyway, when I first saw this option, I figured that the Axela Hybrid was from the Ford era at Mazda, and it was borrowing Ford’s hybrid technology. Upon further inspection, I couldn’t be more wrong. The Axela is the newest generation of the Mazda3. The fully SkyActiv and Kodo-y one. I was shocked that this thing existed because Mazda has been dead set on developing gasoline and diesel engines. A lot of the hype surrounding SkyActiv engines has been around their fuel economy and their lack of hybrid systems. Most of the mystery faded away when I looked at an interior picture and saw a familiar shifter. Toyota. As it turns out, Mazda has had licensing to Toyota’s hybrid powertrain since 2010, so this shouldn’t have been a surprise to me. However, their partnership hasn’t affected the U.S. until recently with the Scion iA, and it didn’t affect Japan until 2013 when the Axela Hybrid came out. Now, after looking at the specs, the Mazda hybrid seems like a bit of a bust. The Prius has way more cargo space since the Axela is just a sedan, and it has a huge battery pack sucking up trunk space. This creates another challenge by eliminating the Axela’s ability to fold the backseats down and open up the trunk to the interior of the car. Also not helping the Mazda’s case is the fact that the similarly equipped Prius manages to get 87.2 mpg in Japan’s efficiency testing. The Axela only gets 73.5 mpg. But there’s more to these cars than meets the eye. First of all, the new Prius came out in Japan in December of last year. The Mazda was released two years earlier and is based off of older hybrid technology. Keep in mind, the Mazda was not designed with the intentions of being a hybrid, unlike the Prius, which is built from the ground up to be an electrified, green, inflated praying mantis, I mean machine. Now, the real differences between the two start with the pricing. The Mazda’s base price is the equivalent of $20,240. The base Prius in the land of GTR’s is $20,710. For this price, the Prius comes with no armrest, a plastic steering wheel, single zone climate control, and not even a radio is standard. Yes, you read that right. If you would like the luxury of listening to something other than CVT whine, you have to pay an extra $230 for their base audio system. If you don’t spring for the radio, Toyota even charges you $11 to get a plastic cover to hide the gaping whole left in the dashboard where the radio would be if you weren’t so cheap. The Mazda, on the other hand, comes with way more standard features. It has the Mazda Connect infotainment system and their seven-inch touchscreen, a leather wrapped shifter and steering wheel, an armrest, and dual zone climate control. Mazda didn’t cheapen out when it came to the drivetrain, either. Keep in mind, Mazda is a smaller company so it is impressive that they put their own resources into developing the Axela’s hybrid system. They could have just shoved Toyota’s four cylinder hybrid combination into the 3, but Mazda actually spent time making Toyota’s parts unique for their car. Ahem Scion iA. 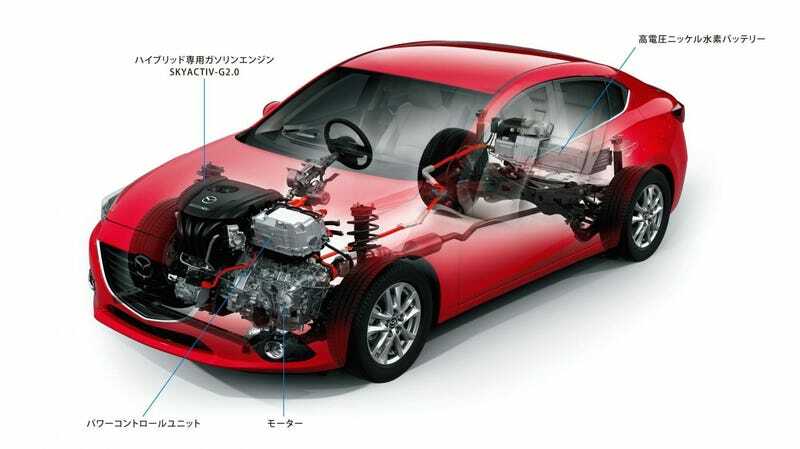 Mazda spent time getting their SkyActiv 2.0 liter engine to work with Toyota’s CVT and electric motor. By using their own SkyActive engine, they are able to get a combined 134 HP and 152 ft lbs of torque out of the drivetrain. The Prius can only pump out a combined 99 hp and 102 ft lbs of torque. This means that the Mazda gets 14 less miles per gallon than the Toyota in a body not designed to be a hybrid in the first place, and with an engine that is two tenths of a liter bigger, has 35 more horsepower, and has an extra 100 pounds to lug around. A transaxle splits output from the SKYACTIV-G into drive power and generator power. In doing so, it transfers the most effective combination of output from the petrol engine and electric motor. The result: seamless, linear acceleration. So, if I’m interpreting this correctly, when the engine’s power isn’t being used to its full potential, a portion of the power goes to recharging the batteries. If the driver smashes the gas pedal into the carpet, the electric motor kicks in to help propel the car until the engine winds up to the best power-producing revs. Mazda also tuned the engine sound to match the engine speed and acceleration of the car. This way, the driver doesn’t have to deal with the sound of a screaming engine and no acceleration, which can be common with a lot of CVTs. Mazda didn’t forget about the brakes, either. They are still regenerative, but Mazda made sure they operate linearly, while maintaining the Toyota efficiency. Obviously, I have not driven this car so I cannot definitively say whether the Axela Hybrid maintains Mazda’s zoom-zoom nature while being part Toyota. The system only adds about 100 pounds to the curb weight of the base Mazda3 sedan, so that’s a good start. However, the Australian website GoAuto found that Mazda’s refinements were successful. The only Toyota-esque characteristics were the shifter, which I think Mazda made look better, the silent starts with the electric motor, and the EV mode. The brakes feel like a normal car, the acceleration is seamless when the engine takes over for the electric motor, and the steering still has the communication Mazda’s should have. So the Mazda Axela Hybrid, with some help from Toyota, drives better, looks better, and is more carlike than Toyota’s own bestselling hybrid. Mazda is just one SkyActiv breakthrough away from being more fuel efficient than the Prius, and beating Toyota at their own game.